An 8-year-old boy, who lost his hands and feet to a serious infection, has become the youngest US patient to receive a double-hand transplant, surgeons said on Tuesday. 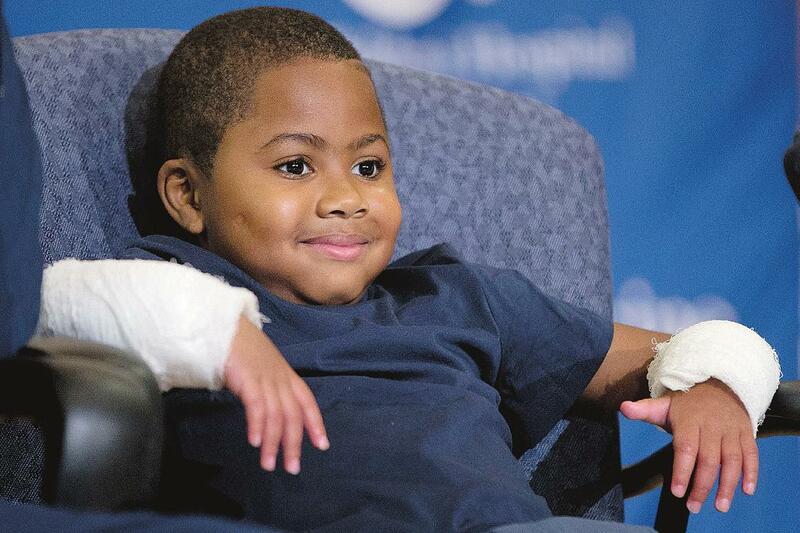 Zion Harvey forearms were heavily bandaged but his hands were visible as he flashed some big smiles Tuesday at a hospital news conference. He demonstrated his still-delicate grip and described waking up with new hands as "weird at first, but then good" at the Tuesday press conference.The boy, from the Baltimore suburb of Owings Mills, Maryland, received the transplant underwent the 11-hour surgery earlier this month at The Children's Hospital of Philadelphia. Though doctors did not publicly disclose the nearly 11-hour operation until this week. A 40-person medical team used steel plates and screws to attach the old and new bones. Surgeons then painstakingly reconnected Zion's arteries, veins, muscles, tendons and nerves. ``He woke up smiling,'' said Dr L. Scott Levin, who heads the hand transplant programme, said, "There hasn't been one whimper, one tear, one complaint from him." Zion contracted sepsis as a toddler, which resulting resulted in multiple organ failure, forced the forcing amputation of his hands and feet by age 4. He needed a kidney transplant, which he received receiving the organ from his mother. Leg prosthetics have allowed Zion to be very active, including walking, running and jumping. APHe learned to use his forearms to write, eat and play video games and has been attending school. Physicians hope he'll now be able to achieve more milestones, including his goals of throwing a football and playing on the monkey bars. "It was no more of a risk than a kidney transplant," his mother, Pattie Ray, said. "So I felt like I was willing to take that risk for him, if he wanted it." Several adults in the U.S. have received double-hand or double-arm transplants in the past few years. Hospital officials in Philadelphia believe Zion is the youngest person to have the surgery, which requires a lifetime of immune-suppressing drugs to ensure the body doesn't reject the new limbs. Zion already had been taking anti-rejection drugs because of his donated kidney, which made him a good candidate for the hand transplant, doctors said. Doctors say Zion will spend several weeks in physical rehab at the hospital before returning home.